Let’s first start out by saying the Oregon defense is not soft. From the glory days of ‘Gang Green’ they never have been, nor will they ever be soft. They might give up big plays here and there, but when the time counts, they step up. The ‘being soft’ sentiment is one that defensive coordinator Don Pellum despises. When coaching, he doesn’t let silly things get in his way — he does use it as motivation. Whether it be motivation during a game, practice, or workouts, Pellum pushes his players. Yesterday, Oregon extended an offer to 4-star inside linebacker, Devin Bush, from Hollywood, Florida. Bush is just the guy Oregon needs. At an even 6 feet tall, and weighing in at about 220 pounds, the stud from Florida has room to grow into his body, so don’t expect him to be stepping on a college field anywhere near the size he is now. Bush’s size, speed, and physicality make him one of the highest touted defensive players in the class of 2016. With offers from Florida State, Georgia, and Alabama just to name a few, the Ducks are certainly in for a tough battle for this kid. Pellum, along with Head Coach Mark Helfrich, know what they want out of a recruiting class. Bush reminds me a lot of Kiko Alonso, and if he ends up producing like Alonso did, that would be a treat to watch. Like father, like son — so many choose to say. 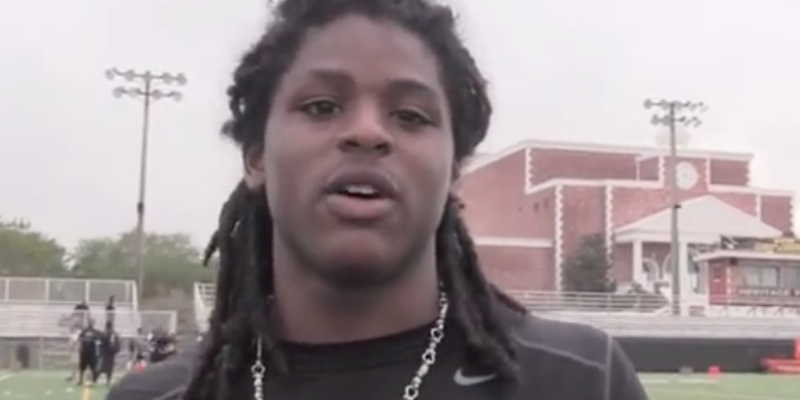 Bush’s father, Devin Bush Sr., played 8 seasons in the NFL. While the younger Bush still has a ways to go before thinking about a professional career, the highlight video below will turn you into a believer. This kid is the real deal! Stay tuned to FishDuck.com, as we will keep you updated with where Bush decides to take his talents, along with other top recruits in the class of 2016.